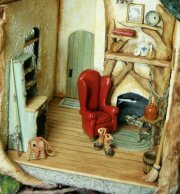 Handcrafted half scale cottage displayed under an 8"x12" glass dome. Carved wood, sculpted trees, stained glass windows, and handmade doors and shutters. Interior wood floors and fireplace. All building components made by hand - no manufactured items. Picture is of finished exterior and ready to decorate. Interior fireplace included. Some furniture and interior decorations are included. Please email or call for availability or questions. All finished cottages are made to order. Available cottage may vary slightly from picture. Please contact me for questions or details. 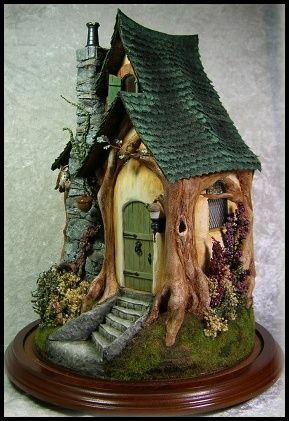 Cottage is also available as a kit in the kit section of web site. 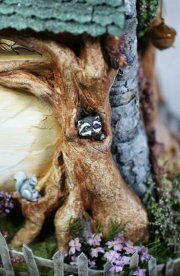 Handmade by Jill Castoral. Designed by Jill Castoral and Pat Holstrom.